Come home to a hot shower and a cold beer . . .
Six and seven years ago we were backpacking every opportunity we had, doing 30-35 mile sections of the Appalachian Trail in Virginia or North Carolina, and hiking into state parks throughout North Carolina. We were going out two weeks plus odd weekends each year. We would drive three or four hours to a motel, meet a trail shuttle the next morning and leave our car at the trail terminus. The shuttle driver would drop us off thirty or so miles distant and we hike back to our car. We aren’t fast hikers, despite being very fast walkers. A thirty pound backpack and up/down trails tend to slow us down a lot. So we have a lot of time to dream and talk when backpacking. March 2004 we were bopping down the trail, having a great day, when one of us starts theorizing aloud about another way to stage our backpacking trips. Just idle talk, sort of, about how far we’ll drive to get home after a three or four day hike back to the car. Our reason for buying our first (of three) Airstreams was, we rationalized, “If we had a camper we could extend our range. A mobile base would allow us, once we retire, to avoid motel fees and we could work any number of new trails from an entirely new section of the country.” And, Jim said, we would return from hiking to a hot shower and a cold beer. For Jim, the cold beer and hot shower might have been the top selling points. 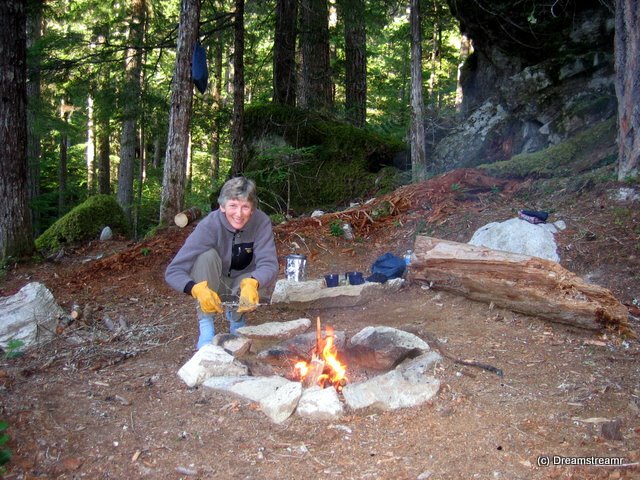 We would hike 30 miles over four or five days and return, elated, to our car at a trail head. We would change into dry (and much fresher) clothes, dig our snack bag from the car’s trunk, and head for home. An hour or three later of driving we would arrive home, grab a cold beer, unpack the car, spread out the gear, start the washing machine, and finally get a hot shower. The difference with having an RV is in our supposed ability to park the RV in a campground or RV Park close to the trail head. Then, getting “home” to the cold beer and hot shower would be much, much sooner. Oh man, backpacking will be so great if we buy an RV. Let’s do it! We drove from Bay View State Park, near Mt Vernon, to Colonial Creek Cmpgrd in North Cascades National Park. After visiting the dams at Diablo Lake and Gorge Creek, we drove to Newhalem to the Cascades NP Visitors Center. Almost as one, we looked at each other and said, “Let’s get a backcountry permit and do an overnighter.” It made perfect sense, the trail head is 100 yards from our camp site, the truck and trailer seem pretty safe here, and we have all our gear. The same afternoon Boy Scouts arrived in our campground, two troops full. Campground is now noisy and busy. Welcome to the weekend. Let’s get outta here. We spent the first part of the afternoon digging our gear out of the various storage places in the truck and the trailer’s cargo compartments. The remainder of the afternoon we packed, picked our hiking clothes, and had a nice home-cooked meal. We hiked from the campground Saturday morning, hiking four hours to McAllister cmpgrd. The trail followed Thunder Creek East-Southeast but changed elevation a lot more than the creek did. We were along the creek for the first fifteen minutes and well above it for all but the last five minutes of the hike. 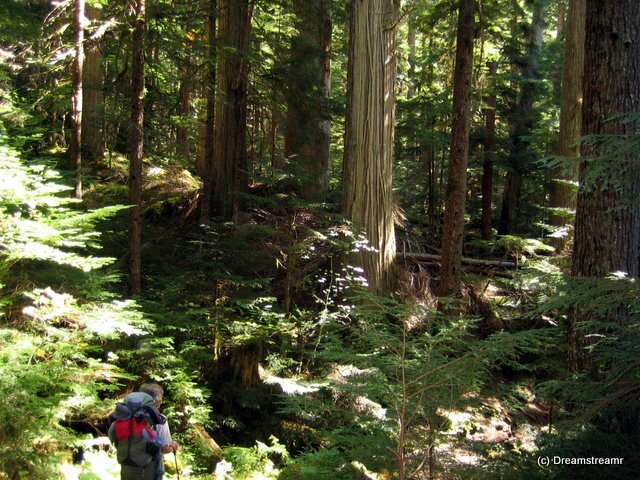 The size and number of huge ponderosa pines, western red cedars, hemlocks, and Douglas Firs is just astounding. One after another, maybe 150 feet tall, arrow straight most of them, and the bases over six feet diameter. This is so neat, to stand at the bases of these trees and stare upward at the crowns so high above us. We saw a wild variety of mushrooms — purple, brown on brown, pink, black, red, yellow, white. Some of the purple, with curly lobes, looked like tiny cabbages, others yellow and looked like little coral with their many tiny fingers. Huge flat-topped round ones pushed out of the packed trail dirt, lifting a three inch diameter crown of earth still on top of them, like Atlas holding the earth on his shoulders. And everywhere, moss covering the ground, the rocks, the fallen trees, extending in all directions up the hill from the trail. This place is wet! The trail is carpeted with fine little evergreen needles and very well maintained. You’d never guess this trail was opened by the prospectors in the 1800s, or improved in the early 1900s by mining developers. It is a simple, clean, narrow trail, very nicely built and while not challenging it is great exercise going up and down the short grades. McAllister Camp is along Thunder Creek, with a couple of sites fifty or sixty feet above the creek. We chose an upper site. From our campfire ring area we had a gorgeous view of Thunder Creek thundering down toward camp, then around and past. Sunday morning we started our campfire from the last night’s fire’s banked coals to warm us a little — it was 41 degrees F when we climbed out of our sleeping bags. After a nice breakfast we broke camp, hiked to Colonial Crk Cmpgrd; made much better time. Apparently we just hiked faster because the trail was net downhill back to Colonial Crk and we didn’t gawk at mushrooms and trees as much. And we were packs off only once, compared to three times on the way in. And now for the hot shower — ahhhhhh. A great plan comes together, more than five years after its conception.